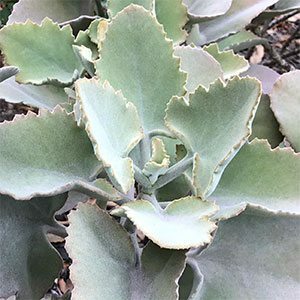 An unusual succulent, Kalanchoe beharensis is grown for the interesting foliage. The leaves are best described as triangular with scalloped edges. The felted texture and stiffness of the leaves adds to the appearance. Over time the plant will form a woody stem and the plant can reach around 2 metres in height in cultivation. Grow it in a container as a feature plant or in the succulent garden. It is an unusual plant in appearance and makes a very interesting addition especially in a position where you can look down on the foliage. A free draining soil is essential, and a position in full sun to a little afternoon shade. grows well in poor soils..
Propagation is from seed, or from the small offsets that appear around the base of the plant. It is also possible propagate from leaf cuttings. Height – Usually to around 2 metres. Flowers – Small yellow flowers in trusses. Flowering season – Mid spring to summer. Foliage – Mid to pale olive green, stiff in texture, with felted and scalloped edges.